While we're about to find out what challenge #7 is for Oiselle's #RunLoveChallenge, last weekend Matt agreed to complete #5 with me: Run Discovered (go out and explore undiscovered territory). 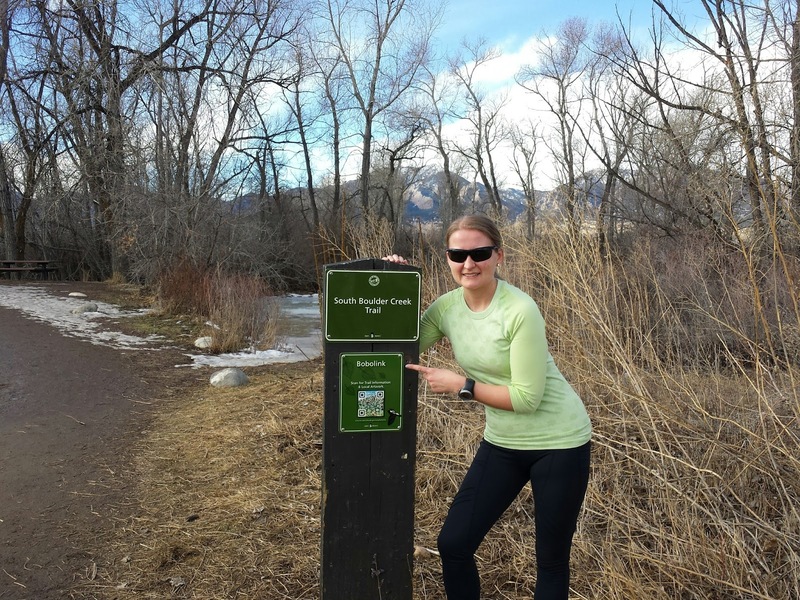 My challenge partner, Lindsay, and I unknowingly got ahead of the game with our run the weekend before through a few Denver parks, but life is boring if you stop exploring. In fact, so far for me, 2016 has been the year of Run Discovered. I've been bored with my normal routes around Denver so I've been mixing things up a bit this year. 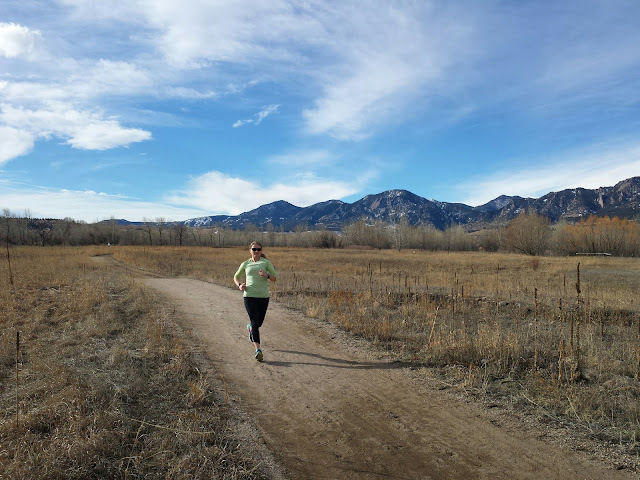 Last Saturday was perfect for a morning run - the temperature had hit the mid-40's before we made it to the outskirts of Boulder, which is jam packed with open space and mountain trails. We rarely make our way there to run but I'd had this one particular trail on my list since I ran a small section of it a year ago with several Oiselle teammates before we spectated the National Cross Country Championships. There's a small parking lot off Baseline at the Bobolink Trailhead of the South Boulder Creek Trail. It was a bit muddy but not too bad and we got on the trail before it got too busy. Unfortunately my legs were not feeling it and I was on the biggest struggle bus from the start. As beautiful as the trail is, my mind was focused on how hard it was to run. It was a big departure from the last few months as I've noticed how well my legs have been reacting on my runs - but it hasn't always been the case. There was a substantial period of time several years ago when I popped ibuprofen daily and rarely left for a run without taking an Excedrin. There were several reasons for this including chronic stress fractures, over training, not recovering well - but thankfully I got off that bad habit a while ago and it's long behind me. Although I did continue to deal with heavy legs. When I was down and out last summer with a popliteus injury, I was forced to refocus on stretching and strengthening. 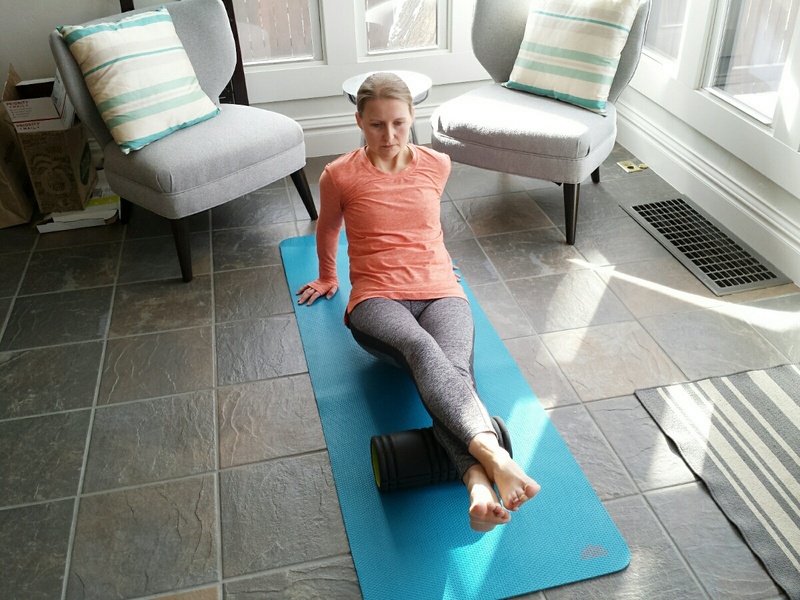 My PT told me she spends 10 minutes a day with a foam roller, which has stuck with me; if she can find 10 minutes each day, I can find at least a few. I believe that taking time to roll out before and after each run is why my legs have felt so good lately. Most of my weekday runs happen at the gym this time of year so I've made a habit of heading straight to the studio for dynamic stretches and a few minutes of rolling before I get on the treadmill. This is crucial because we're at the gym at 5:00am, only 20 minutes after we wake up and I need to wake my body up a bit before I put it to work. Also, we have our roller and a yoga mat in our living room so it's impossible to forget before weekend runs. This has made a world of difference. Of course, that is, except for my run last Saturday. The first three miles really just sucked. There's no other way to describe it. One of the great, and frustrating, things about running is that you never truly know what kind of run you're going to end up with. While I had hoped we could have gone longer to enjoy the beautiful views, I had to turn back at 3 miles. It got better a few miles down the trail, but some days just aren't great. That said, a less-than-ideal run is still better than sitting at home! And a delicious brunch on Pearl Street helped me move on pretty quickly. This past week I've been more focused on rolling out and took a step back on mileage during the week hoping it would help me out today, which it did. The key to all this is consistency, so making it as easy as possible (like keeping the roller in the living room) is important. How do you get over lousy runs? * What do you do between runs to help with recovery?